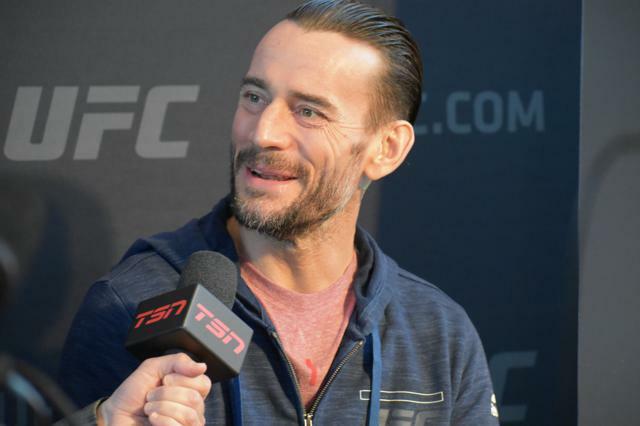 Of all the interesting outcomes from this weekend’s stellar UFC 225 card, the one thing I continue to think about is what will happen with CM Punk? As an MMA fan and journalist and a lifelong wrestling fan, I found myself drawn to the former WWE Superstar at media day on Thursday afternoon. So much had been said about Punk’s attitude and personality during his time with WWE. While the majority of fans seem to love Punk, there is a segment out there who seems to not care if he ever steps foot back in a wrestling ring. One thing is for sure, you can’t deny Punk’s cult-like following. When news broke the former champion was doing an autograph signing in September at Pro Wrestling Tee’s in Chicago, the event sold out in less than 5-minutes. So yes, as much as Punk is loved in the wrestling ring, he also is hated by many. That became evident after his defeat to Mike Jackson on Saturday night. Many took to social media to mock Punk. WWE announcer Corey Graves blasted the former champion on Twitter. Personally, I felt Graves all out assault on Punk was a bit cowardly and unneeded. Talk about kicking a guy when he’s down. It’s clear that there are those in WWE who resent Punk for leaving and stating how poorly he felt he was treated by the WWE. Many have called him a cry-baby, but yet there are still the loyal legion of Punk supporters who would welcome him back to wrestling with open arms. Following Saturday’s loss, Punk was unavailable for an interview due to being taken to the hospital for a CT Scan of his face. UFC President Dana White did talk about Punk at his post-fight press conference. He called Punk a friend but said he hopes Punk will stay out of the Octagon. At 39-years old, Punk’s body probably can’t take many more beatings like the one he endured at the hands of the now fired Mike Jackson. Jackson seemed to be goofing around during the 3-round bout, refusing to end it, thus allowing Punk to suffer more facial injuries. It was clear Punk had improved in the nearly 2-years since his first loss, but it was also clear that he was in way over his head. While many in the press and some in the audience mocked Punk for looking like an amateur, it should also be said that he showed a lot of guts out there. Punk never quit despite looking gassed after the first round of the fight. The man was chasing his dream and didn’t care what anyone thought, something that you have to admire. In talking to the former Ring of Honor and WWE star on Thursday, it was clear that he truly loves MMA. It’s also clear that he was happy to have the defamation trial behind him. If you were unaware, Punk was cleared of the defamation suit brought against him and Colt Cabana by a WWE doctor. It seems kind of strange that the case would happen the week of his fight, which was no doubt a distraction, but you could tell in winning the case, a giant weight had been lifted off Punk’s shoulders. He was smiling, talkative, kind and approachable. These were traits that many had said Punk rarely exhibited during his time with WWE. In the nearly 5 years since Punk left the WWE, the wrestling business has changed. It has changed for the better. While Punk may never go back to WWE, he could still have a nice career in Ring of Honor, a company he got his start in. There is no doubt that Punk loved wrestling as a young man. If, at 39, he still loves it, that’s debatable and only he knows that. The door is open for Punk to return ‘home’ to the wrestling business if he so chooses. His fans would welcome him with open arms in any company. While I don’t think the WWE would be a good situation for Punk, I could see the company offering him a spot. I could also see the company burying him if he were to return. That would not be a good situation. As far as ROH goes, I think that would be the perfect spot for Punk. The company is doing quite well and if Punk would join ROH, it would be nothing but a positive thing for everyone involved. As I sat there next to the Octagon in Chicago on Saturday night, I kept wondering why the MMA community hated Punk so much? Maybe his fight should not have been on the main card, but how can you not pull for a guy who is chasing his dream and giving it his all? There were those who supported him. Din Thomas and Michael Chandler both spoke of their support for Punk to me on Twitter. Thomas even saying he was proud of Punk. It was nice to see that there were some out there who supported him. When Punk’s music hit on Saturday night, it was a reminder of just how special his time in the squared circle was. I couldn’t help but get goosebumps when ‘Cult of Personality’ hit. Most of the fans in attendance seemed to be behind their hometown boy and just for a little while at least, it took me back to when he was one of the biggest stars in wrestling. While I would love nothing more than to see Punk back in a wrestling ring, I am more hopeful that the man, Phil Brooks is content. I hope he is happy. He seemed like it on Thursday. He seemed like he was enjoying life again, and as a human being, that’s what is most important to me, not whether or not he gets back in a wrestling ring. While Dana White made it clear that Punk is done in UFC, it’s unclear if his MMA career is over. Only time will tell if Punk will ever step foot in an octagon, much less a wrestling ring again. Regardless, I hope fans respect Phil Brooks for what he attempted to do. Following your dreams is never easy and in life you will get knocked down. I have no doubt that Punk will get back up. With whatever he chooses, I just hope he is happy.